Gordon Bell is a researcher emeritus (ret.) at the Microsoft Research Silicon Valley Laboratory. His interests include extreme lifelogging, digital lives, preserving everything in cyberspace, and cloud computing as a new computer class and platform aka Bell’s Law. He proselytizes Jim Gray’s Fourth Paradigm of Science. 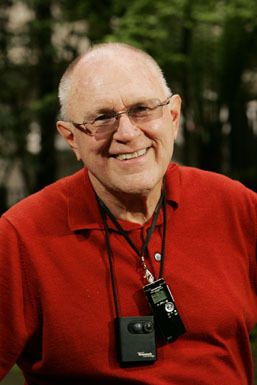 Gordon has long evangelized scalable systems starting with his interest in multiprocessors (mP) beginning in 1965 with the design of Digital's PDP-6, PDP-10's antecedent, one of the first mPs and the first timesharing computer. He continues this interest with various talks about trends in future supercomputing (see Papers… presentations, etc.) and especially clustered systems formed from cost-effective “personal computers”. As Digital's VP of R&D he was responsible for the VAX Computing Environment. In 1987, he led the cross-agency group as head of NSF's Computing Directorate that made "the plan" for the National Research and Education Network (NREN) aka the Internet. When joining Microsoft in 1995, Gordon had started focusing on the use of computers and the necessity of telepresence: being there without really being there, then. "There" can be a different place, right now, or a compressed and different time (a presentation or recording of an earlier event). In 1999 this project was extended to include multimedia in the home (visit Papers… presentations, etc.). He puts nearly all of his atom- and electron-based bits in his local Cyberspace—the MyLifeBits project c1998-2007. This includes everything he has accumulated, written, photographed, presented, and owns (e.g. CDs). In February 2005 an epiphany occurred with the realization that MyLifeBits goes beyond Vannevar Bush's "memex" and is a personal transaction processing database for everything described in June 14, 2005 SIGMOD Keynote. The MyLifeBits project with Jim Gemmell is described in an article by us in the March 2007 Scientific American. Alec Wilkinson described Gordon and the MyLifeBits effort in the 28 May 2007 issue of the New Yorker. By the publication of the book the final epiphany was that our e-memories are where the records reside and bio-memories are just URLs into these records. Jim Gemmell and I have written a book entitled Total Recall: How the e-Memory Revolution Will Change Everything which was published in September 2009. See Amazon, Barnes & Noble, Borders, or IndieBound. Your Life, Uploaded: The Digital Way to Better Memory, Health, and Productivity is the paperback version published September 2010. It is available in Dutch, French, Italian, Japanese, Korean, and Portuguese. Also check out the Total Recall book website. Supercomputing and the CyberInfrastructure articles, memos, talks, and testimony regarding high performance computing e.g. funding, goals, and problems in reaching to the Teraflops in 1995 and Petaflops in 2010. THE COMPUTER MUSEUM ARCHIVE An archive of The Computer Museum in Boston 1980-1998. In 1995, TCM’s artifacts formed the basis of the Computer History Museum, Mountain View, CA. The official site of The Computer Museum Archive is tcm.computerhistory.org. 6. The timeline of the history of The Computer Museum gives the critical events in the life of TCM with exhibits, lectures, reports, publications, etc. Gordon's Cyber Museum that has Bell's books, the Hollerith Patent, the CDC 8600 Manual, a talk about Seymour Cray, an album of supercomputer photos, posters about the history of computing, etc. Gordon Bell's Digital Equipment Corporation (DEC) Cyber Museum artifacts, books, brochures, clippings, manuals, memos (e.g. The VAX Strategy), memorabilia, photos, posters, presentations, etc. relating to Digital Equipment Corporation a.k.a. DEC.
9. The Timeline of Computer History BC to the present. Gordon Bell’s view of the important events that formed the computing age in 10 event lines: Epoch Inventions, Control Technology, Control Computers, Calculators, Personal Computers, Transduction aka interfaces, Business and Record Keeping computers, AI, Communications, Publications-ideas, and Companies. The Computer History Timeline, BC to the present. Gordon Bell view. 10. Supercomputing 2014, 18 November Seymour Cray Award acceptance talk. This PowerPoint talk on the history of supercomputing covers the period 1960 to the present with two distinct eras: mono-memory computers that Seymour Cray defined 1963-1993; and Multicomputers or Clusters 1984-present. YouTube talk access of the video . 11. Bell’s Law of Computer Classes (first draft) YouTube PowerPoint presentation with Gordon Bell’s voiced comments about the dozen computer classes and industries 1951-2015. 12. The Laws and Folly of Prediction. YouTube talk at the 1997 ACM 50th Anniversary Conference, San Jose--3 years before the 2000 internet bubble; and 2007 rise of smartphones. While my ability to predict is stuck at a maximum of 10 years, the long term accuracy is correct -- Everything will be in Cyberspace e.g. the Body Area Network c2014. Laws of prediction are cited along with example gone awry predictions. 13. Gordon Bell The Future of Computers MIT 1972. This YouTube videotaped talk demonstrates my limited abiliYou ty to predict in 1972 as VP of R&D at Digital Equipment Corporation (DEC). I had returned from being on Carnegie Mellon University faculty with the goal of getting DEC into VLSI technology. Recall the first commercial microprocessor had just been introduced a year earlier. This talk is about where computing was headed that I could see in 1972. 14. Counting Every Heart Beat: Observation of a Quantified Selfie MSR-TR-2015-53. View graphs from the TR of Bell heart rate, etc. Here. Bell's Law of Computer Classes and Class formation October 24 YouTube Talk (50 min lecture for Computer History classes)was first described in 1972 with the emergence of a new, lower priced microcomputer class based on the microprocessor. Microsoft Technical Report MSR-TR-2007-146 describes the law and gives the implication for multiple cores per chip, etc. Established market class computers are introduced at a constant price with increasing functionality (or performance). Technology advances in semiconductors, storage, interfaces and networks enable a new computer class (platform) to form about every decade to serve a new need. Each new usually lower priced class is maintained as a quasi independent industry (market). Classes include: mainframes (60's), minicomputers (70's), networked workstations and personal computers (80's), browser-web-server structure (90's), web services (2000's), palm computing (1995), convergence of cell phones and computers (2003), and Wireless Sensor Networks aka motes (2004). Beginning in the 1990s, a single class of scalable computers called clusters built from a few to tens of thousands of commodity microcomputer-storage-networked bricks began to cover and replace mainframes, minis, and workstation. Bell predicts home and body area networks will form by 2010. See also the description of several laws (e.g. Moore's, Metcalfe's, Bill's, Nathan's, Bell's) that govern the computer industry is given in Laws, a talk by Jim Gray and Gordon Bell. 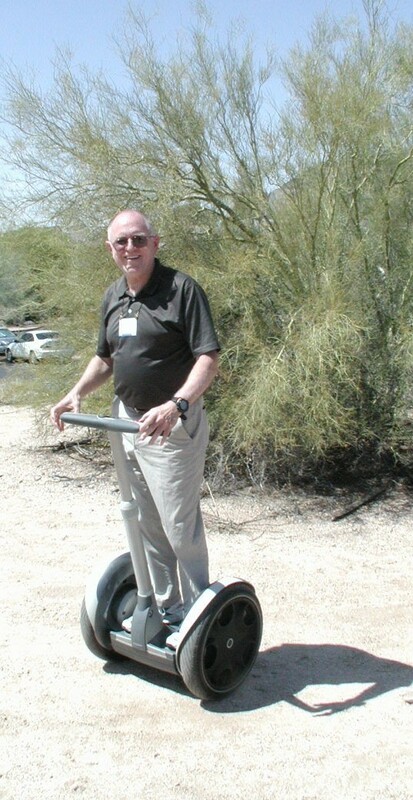 Gordon was with his Diamond Exchange colleagues at the Boulders, Carefree, AZ where the group tested the Segway, a dual-processor, two wheeled, computer and Human Transporter. Since the test in 2002, he has taken and recommended tours in the Pacificia near San Francisco, and Washington, DC. Right is the SUV version.